Last night my internet refused to work. I pondered skiving off writing a piece , but then realized that it would be the easiest thing to do. Taking the easiest course is not something that this particular character ever contemplates, however, so I figured it would only be keeping in the spirit of things if I shook myself, hurled away those thoughts of relaxing with a bowl of chips and salsa and instead, plunged straight into a hard-hitting piece on the wonder that is…. Egwene and I had a love-hate relationship for a long time. I tend to dislike on principle the girl paired with the hero in any fantasy story—hence my dislike of Cho Chang (I was twelve when I read about Harry’s stirrings of interest in her during a Quidditch match, and knew immediately that this girl was a ‘threat’), Ginny Weasley (in my defence, I am not alone in this), Elayne Trakand (again, I don’t need to justify myself) and Min (she was cool to start off with, then quickly became all about Rand). I think this is something to do with my own burgeoning love/crush on the hero, and my identification of this female as a rival, no matter how silly and psychotic that sounds. It goes to show how deeply the women-beware-women trait has been ingrained in me, that I look upon a character in a fantasy story as a rival out to steal what should be ‘mine’. Of course, it is a whole other level of neurotic that I look upon the male characters as people to be ‘had’ or romantically inclined towards in the first place. Another, slightly more generous explanation for my dislike of these characters could be my fear, often justified, that they would lose all individuality and importance as anything other than the hero’s girlfriend. Look what happened to Ginny in the Potterverse- here we had this young, shy girl blossom into a hotshot Quidditch player who then did nothing but ‘snog’ Harry. Another example is outlined in my previous post on Nymphadora Tonks (from the same universe), where a promising character got turned into a baby producing device, lopped off from further growth in her own right. Perhaps I feared that Egwene would suffer the same fate. Thankfully, I was proved wrong. 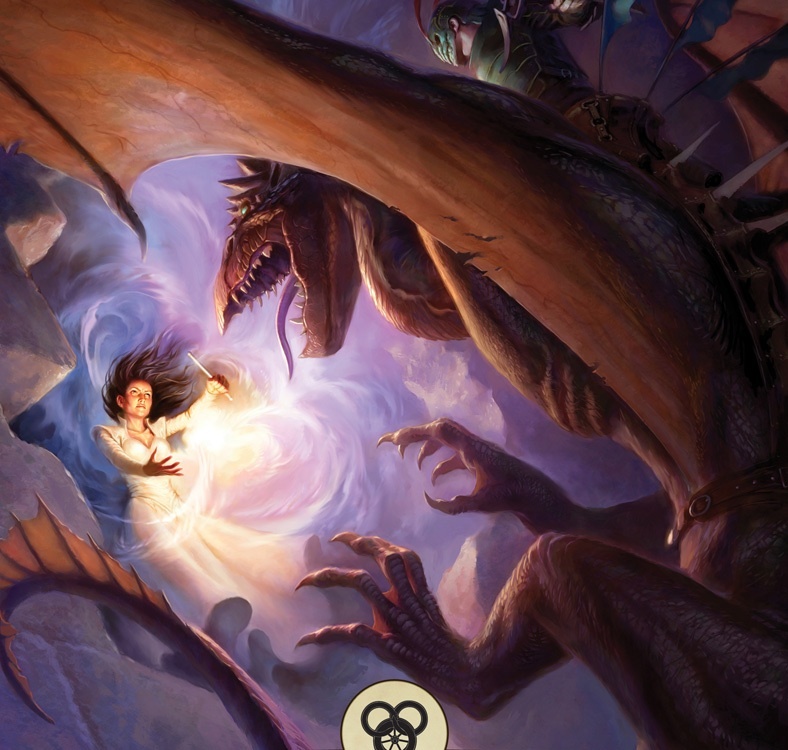 Not only did Egwene not turn out to be Rand’s ultimate flame, but she laid to rest any fears of becoming little more than a romantic interest for any character. In fact, she turns the tables, with her own consort wondering if he has any role besides being there for her. Why did I choose Egwene to be the standard-bearer of my ‘Women in Fantasy’ series? Quite simply because she has had the farthest to go from all those I have on my little list—not only does she achieve the most, rising from a village girl with ‘unbraided’ hair to position of most powerful woman in the world, but she has changed me, changed my perspective on her through the course of fourteen books in ten years. To put it succinctly, I have had the longest and most involved, emotionally charged relationship with her that I have had with any female fantasy character. I started out disliking her intensely, being annoyed with her and gradually came to grudgingly admire her, until I can finally say with complete honesty that she is my favourite character. Right after Lanfear, but really, I wouldn’t want to be friends with that one. I feel like Egwene and I have had a relationship and grown together. There’s a difference between liking a character for the entertainment value she affords (Lanfear) and liking her as a person and wanting to be like her. That’s how I feel about Egwene. Whether its her resourcefulness, her courage under fire, her compassion coupled with professionalism or her endearing lapses into classic twenty-something-ness, Egwene is a woman who has made her way steadily in hard circumstances, and won her place at the top. What I really like about her is this tenacity in her beliefs, her knowledge that she can make things better, that she can push herself and succeed against all odds. She never doubts herself, except for a brief, horrific period early on in the series when she is captured by the Seanchan. This remains a traumatic point for her, and she revisits is constantly in nightmares and revenge scenarios, but ultimately, she overcomes even her debilitating fear of the a’dam and manages to move past it through sheer will. Egwene is told often that she is ‘stubborn’, a sure match for Rand. She is the only one who has the determination and the courage to face him down, to disagree with him when she finds his plans unsatisfactory. She refuses to let his greater power or vaunted status daunt her, and she is the only one in hall full of usually collected people who manages to keep a clear head when addressing the Dragon Reborn. Surely that says volumes about her faith in herself, even if nothing else does. As a young woman, Egwene gets her fair share of patronization. She is practically bullied into accepting a position of power, used as a puppet for a time and has to do a fair bit of manipulating and intimidating to ensure that her followers take her seriously as a leader. She makes mistakes, for sure, as any newbie would in her position. Despite her strong views against it, she keeps a woman in slavery, much as it makes her mouth curl with distaste. She treads on toes, makes faux pas and generally tries a bit too hard. But here, I had to sympathize with her. It can’t be easy trying to head a bunch of women, most of whom are centuries older than you and certain that they know best how things should be run. She stumbles, yes, but the important thing is that she rights herself and moves along a path of her own making; she doesn’t just stride smoothly onto a road laid out for her. I think this, finally, is Egwene’s most important quality, and why I look up to her the way I do. She believes in facing the world head on, looking into the eyes of those who would try to choose a path for her and telling them firmly and clearly, no. She makes her decisions and stands by them; she is not afraid to forge ahead even when all ahead of her seems dark and dreary; she trusts herself far more than she trusts or depends upon the world around her. Egwene exemplifies the power of self belief, the power that rests in the ability to pick yourself up after the world has knocked you down and to just keep on going. She performs the power of the words ‘never give up’ . So when I find myself wondering what the point of it all is, whether there is any hope of things ever changing for the better in this fear and grime riddled world, I look to her for inspiration. And I always, always find it. To the strength of self confidence, determination and courage in the face of darkness. To Robert Jordan’s Egwene al’Vere. You are my heroine. First off, apologies for the delay and the silence and the lack of updates on awesome female fantasy characters. Travel and work have prevented me from hacking away at my laptop in the cause of literary immortality. Alas, I can only hope to make up for lost time with an extended celebration (spilling past Women’s Day), but since I doubt the virtual world will really mind it, no worries! Today I take up the cause of a character I believe was let down by her creator. Don’t get me wrong, I LOVE the Harry Potter series (as anyone who has glanced cursorily through this blog would know), but that same love does not blind me to its (perceived) faults. One of those, I think, is the use or misuse of Nymphadora Tonks, the young Auror who trips her way into the series in my favourite book, The Order of the Phoenix. Nymphadora^, or Tonks as she prefers to be called, is not your everyday girl next door, though she could possibly look like one when needed. Not only is her job an action-heavy, dangerous one that is notoriously difficult to qualify for, but her Metamorphmagus abilities also make her a great asset for the ‘Light’ side*. Besides all this, she also has an interesting family background. Her mother, Andromeda Tonks nee Black, is the sister of Bellatrix Lestrange and Narcissa Malfoy, the former being a leading Death Eater and Voldemort’s ‘lieutenant’, the latter the wife of one of the (arguably) most attractive and valued Death Eaters and mother of fanon’s darling, Draco. Andromeda, we are told, broke with tradition (much like Sirius would do after her), and married a Muggleborn, Ted Tonks. Tonks is the product of a ‘blood traitor’s’ attraction to a ‘Mudblood’. Tonks represents, in a manner, the beauty and potential of a society united, and not divided along lines drawn by blood and upbringing. She is similar, in this manner, to Harry, also a child of pureblood-Muggleborn parentage and possessor of unique talents (not as unique as Tonks’s, but what the hell). Her body thus comes to signify the aspirations of the side that fights against Voldemort and his eugenics theories, and with its ever changing, ever shifting form, it highlights the many directions that this society’s future could take. We don’t even have to delve too deeply into these ‘symbolic’ aspects to know that Tonks is awesome and atypical as a female character. She is spunky, clumsy, and not afraid to wear her hair loud (when Harry meets her, she has bubblegum pink hair in spikes). Not only this, but she seems to exude enthusiasm and energy, winking, joking and generally breathing a spirit of life into an otherwise dreary and danger-ridden Order mission. She provides the perfect counterweight to Moody’s paranoia, her humour lightening the atmosphere and reminding us that yes, we are in a universe where the hero will eventually save the day. Given her unconventionality (nowhere does Tonks come across as a damsel in distress), it is really a pity that Rowling, for all practical purposes, dropped the ball on this one. I fail to understand WHY she had to make Tonks a lovelorn, power-losing weakling in ‘The Half Blood Prince’. Surely we didn’t need another love story in a book that was already bursting at the seams with unfulfilled teenage lust and hormones? As far I can tell, the Remus Lupin- Nymphadora Tonks pairing did little but produce a child with inherited Metamorphmagus abilities (and this after we had been told how very rare those abilities are). If there is one thing J K Rowling has taught me through Tonks, it is what NOT to do with a promising character. There doesn’t seem to be much point in creating what appears to be a wonderful and unique character, consciously breaking stereotypes, and then forcing her back into those stereotypes in order to make one male character (not) very happy for the duration of half a book. If the Lupin-Tonks pairing had been written better, if it had been made clear that it was a relationship of equals rather than the whining of one character and the hardpressed do-gooder-ness of the other, I might have less trouble buying it. 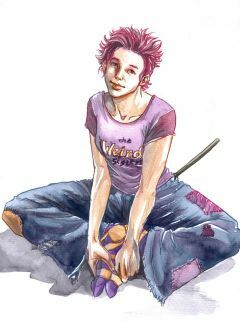 Unfortunately, I have to turn to fanfiction to provide me versions of Tonks that I can admire (post and pre OoTP), such as the wonderful version of her created by SnorkackCatcher in ‘Nymphadora Tonks and the Liquor of Jacmel’. Read it, I promise you won’t be disappointed. Seriously, it’s at moments and with characters like this that I’m exceedingly grateful for fanfiction. Tonks might have been let down in canon, but in fanon, she battles, transforms and shines on, destroying stereotypes and teaching girls that they can be just whoever they want to be. *The ‘side’ that Harry is part of, that fights against the Death Eaters, is never specifically hailed as the ‘Light’, but this seems to be an accepted term in fanon. Hence my use of it here. ^It’s really no wonder that this woman dislikes her first name, as nymphs in Greek mythology are ‘minor deities which appear in the form of young, pretty girls’. We have her asserting right away that she is NOT to be confused with one of those delicate seeming creatures. …from all of Tolkien’s work. Hello! Here I am on Day 2 of the lead-up to International Women’s Day, On this most beautiful Friday night (the wind is gusting outside and Spring- or what passes for it here- has come to make its fleeting presence felt in the dusty city), I present my homage to my second favourite character from Tolkien’s canon, Eowyn, Daughter Eomund, White Lady of Rohan. My favourite character, incidentally, is Faramir, the man who (*spoiler alert*), marries her. The physical description of Eowyn itself proves that slotting her will be problematic. She resembles in her fairness and with her streaming golden hair the traditional pure, untouched princess. Even her title, ‘the White Lady of Rohan’ iterates the idea of purity and chastity. To add to this, when we are first introduced to her, the readers learn that she is being dogged by darkness both within and without: the desire of Grima Wormtongue, the King’s twisted counselor, and her own restlessness conspire to weave about her a cursed aura. 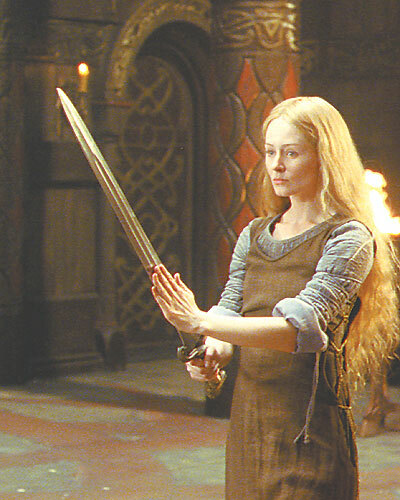 In this way, Eowyn comes into a subcategory of the fairy tale princess: the Innocent Persecuted Heroine. Miranda Otto as Eowyn in Peter Jackson’s TLOTR. ‘Eomer grasped his sword. “That I knew already,” he muttered. “For that reason I would have slain him before, forgetting the law of the hall. But there are other reasons.” He stepped forward, but Gandalf stayed him with his hand. ‘Then out of the blackness in his mind he thought he heard Dernhelm speaking; yet now the voice seemed strange, recalling some other voice he had known. No longer restless and ‘unwomanly’, Eowyn learns the value of ‘pity’ and ‘love’, she is ‘re-domesticated’, ‘tamed’ (she herself uses the word to describe the effect Faramir has on her) and reined back into her rightful sphere. She still shines gloriously, but now as the ‘White Lady of Rohan’, the wife of the Steward, a woman for whom ‘things will grown with joy’, not fall dead to her sword.